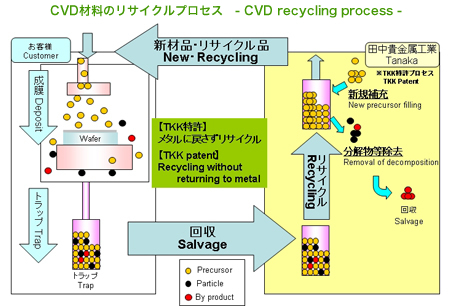 In the first volume of this series, entitled "-Urban Mines-Taking the Most Advantage of Limited Resources," we briefly introduced Tanaka Precious Metals Group's commitment to recycling by using PCs as an example. In this second volume, we will dig deeper into this subject and introduce our recycling system and technologies. At Tanaka Precious Metal Group, we perform all precious metal recycling processes within the group, from recovery and refining of products to their remanufacture. Let’s look at an overview of our precious metal recycling follows. In the first step of our patented precursor recycling process, a precursor that was not deposited on a wafer is trapped and salvaged. After the resolvent and impurities are removed from the precursor, it is refined into a new precursor. Through this process of refining salvaged precursors into new precursors without returning them into bullion first, this process allows customers to realize cost reductions. These advanced technologies bring customers variety of advantages as well, such as reduction of material costs, risk reduction of fluctuations in precious metal prices, and reduction of CO2 emissions. Furthermore, by recovering and refining their currently used plating solutions and then converting such solutions during the low precious metal density process by using our recycling system, customers can not only reduce the cost of "re-make up" but also generate profits using the content of the precious metals contained within the plating solutions. Because of the high standards of our recycling technologies, Tanaka Precious Metals Group has been certified by an official agency. In 1978, Tanaka Precious Metals Group was accredited as a certified melter of gold at the London market (the first Japanese company to receive such an accreditation), the most prestigious gold market in the world. 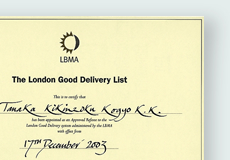 In 2003, Tanaka Precious Metals Group was accredited as a Good Delivery Referee for gold and silver by the London Bullion Market Association (LBMA), a trade organization for the global gold and silver markets. There are only five Good Delivery Referees in the world, and Tanaka Precious Metals Group is the only company in Japan accredited as such, signifying the global recognition of our melting technologies and analytical skills have received. Moreover, we suggest cleaning any precious metals adhering to jigs in order to recycle them as well as precious metal recovery systems to prevent the loss of the valuables contained in waste liquid. Aiming to become an environmentally friendly company, Tanaka Precious Metals Group continues to commit to the recycling business to meet customers’ expectations.